I like pasta and in the summer, a lighter cream sauce tastes better to me than a thick red sauce. This recipe is quick, tasty, and if you want to make it a little healthier, stir in some fresh spinach leaves right before you serve it. Oh! And I also use angel hair pasta. Take just 20 minutes for simply delicious Spaghetti Carbonara. 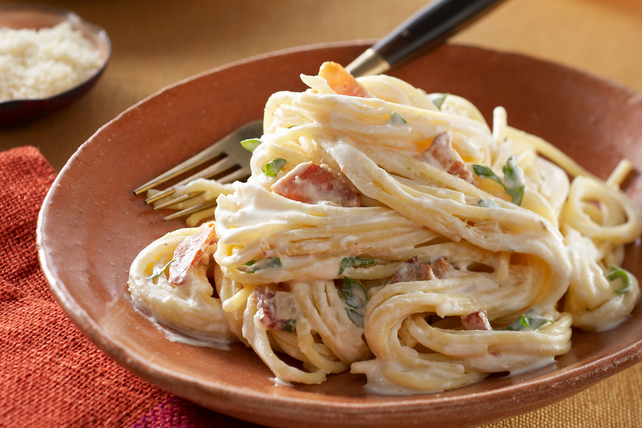 Cream cheese, bacon, onion, Parmesan and zesty dressing add Italian restaurant-worthy flavor. Meanwhile, cook and stir bacon and onions in large skillet on medium-high heat 8 min. or until bacon is crisp and onions are tender. Remove from skillet; drain. Wipe skillet with paper towel. Drain spaghetti. Immediately add to skillet with bacon mixture and all remaining ingredients; toss until cream cheese is completely melted and mixture is well blended. Pippa Duncan, the heroine in my just-released Harlequin Desire CLAIMING THE COWGIRL’S BABY, has this recipe in her recipe box. She tweaked it so that she made only one serving but now that Kade is in her life, she’s back to fixing the full recipe. Click HERE to watch Kraft’s video of making this yummy dish. This entry was posted in Writing Life and tagged characters, food, recipe, Red Dirt Royalty, Tuesday Treats, writing. Bookmark the permalink. Looks yummy. I read about Pippa and Kaden yesterday. So good! Yay! Glad you liked them. I’m going to make this for dinner tomorrow. Tonight is $10 Papa Murphy’s pizza and All Star game. I found bacon on sale, so tonight’s BLTs!